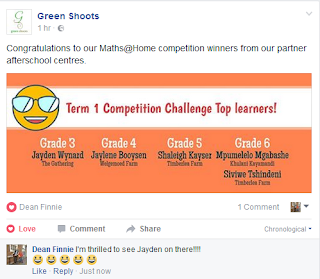 Jayden is the first Competition Challenge winner from The Gathering's Homework Club and we are thrilled for him. Thank you Green Shoots for being such a brilliant partner to us. The good news keeps on coming... as of next term we're moving from three to four sessions and this will allow us to serve 24 kids rather than just the 12 we can presently. Thank you Lord for your favour!